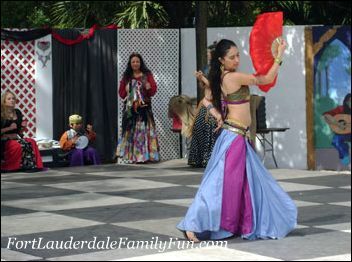 The Renaissance Festival performances are staged by the professional actors, dancers and musicians. Quite a number of them have been performing for this Renaissance Festival as well as other Renaissance fairs all over the country for a number of years. Most of the shows and performances are suitable for all ages although there are some that are probably best left for the adults-only crowd, especially the shows performed at the Great Hall. Nothing inherently bad about them really, it’s just that the jokes turn to be more of the bawdy and steamy kind. There is a stage made just for the smaller children called Once Upon a Stage. The performances here are based on fairy tales and stories most children grow up told with cute and surprising little twists. The storytellers also engage the kids and get them to participate. There are also shows that include magic and music. Unless you have a schedule of all the shows, it could be challenging to keep track of who is performing and when. The performance schedule is posted at the RenFest website as well as short introductions to the different performers. Read the intros and highlight the performances you’d like to see and print out the schedule to make the most of your visit. Some of the highlights are the gypsy dancers and the Irish dancers who perform several times throughout the day. The musical groups are also very popular and the jugglers and acrobats always bring cheers from the crowd. But maybe the most impressive performances are the birds of prey and archery demonstrations as well as the jousting battle show, all at the Field of Dreams stage that easily entertains a hundred spectators or more at once. Renaissance culture come to life! Whichever performances you choose to see, go with an open mind and be ready to learn a few things and to laugh at the entertainers and also laugh at yourself! Before all the trappings we now have in the wired world, we once sought entertainment from each other without any fancy gadgets, just people gathering around and sharing a moment together. Enjoy the Renaissance Festival Performances!